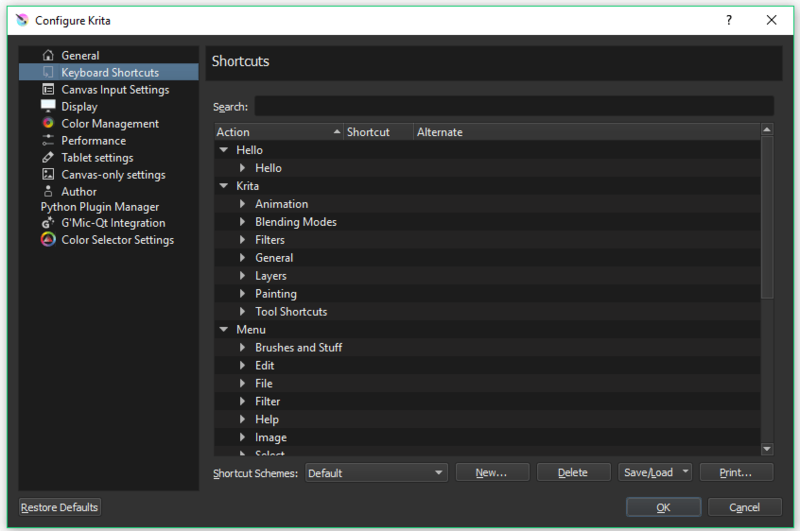 Most of Krita’s shortcuts are configured in the menu section Settings ‣ Configure Krita ‣ Configure Shortcuts. The shortcuts configured here are simple key combinations, for example Ctrl + X to cut. Shortcuts can also be sequences of key combinations (e.g. Shift + S then B). Krita also has a special interface for configuring the mouse and stylus events sent to the canvas, found under Canvas Input Settings. Entering text here will search for matching shortcuts in the shortcut list. The bottom row of buttons contains commands for exporting and import keyboard shortcuts. Each shortcut is assigned a default, which may be empty. The user can assign up to two custom shortcuts, known as primary and alternate shortcuts. Simply click on a “Custom” button and type the key combination you wish to assign to the shortcut. If the key combination is already in use for another shortcut, the dialog will prompt the user to resolve the conflict. Many users migrate to Krita from other tools with different default shortcuts. Krita users may change the default shortcuts to mimic these other programs. Currently, Krita ships with defaults for Photoshop and Paint Tool Sai. Additional shortcut schemes can be placed in the ~/.config/krita/input/ folder. Users may wish to export their shortcuts to use across machines, or even share with other users. This can be done with the save/load drop-down. Note: the shortcuts can be saved and overridden manually by backingup the text file kritashortcutsrc located in ~/.config/krita/. Additionally, the user can export a custom shortcut scheme file generated by merging the existing scheme defaults with the current customizations.